Never has a prime minister’s first Cabinet been more insulting. Never has it mattered less. I can understand the bewilderment many Australians felt hearing we were going to be run by a board of 19 men and 1 woman. 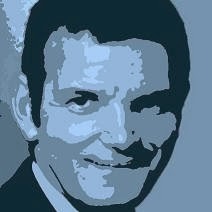 Junkee.com reckons there are more women on the board of AFL, the Prostate Cancer Foundation, the executive of Zoo Magazine, in the Iranian Cabinet and in Saudi Arabia’s Olympics team. It’s not as if women aren’t qualified. An extraordinary 30 per cent of Australian women in their thirties and forties have university degrees. A less-impressive 27 per cent of similarly-aged men are so qualified. Should we be worried about the Cabinet? Not in the least. It’s the Coalition that should be worried. It has a serious problem using and finding talent. Australian men should be worried as well, because away from the Cabinet things are moving against them at a blistering pace, so quickly most don’t have a clue what’s happening. Professor Sue Richardson spelled out the changes at this week’s Social Policy Conference at the University of NSW. One of Australia’s leading labour market scholars, she directs research at the National Institute of Labour Studies and sits on Fair Work Australia's minimum wage panel. Delivered just hours after Abbott unveiled his Cabinet, her address was entitled Breadwinner Men and the Gentle Invaders. It showed women grabbing men’s jobs, their incomes and their prospects in marriage. It starts with education. Back at the start of the 1980s an impressive 11 per cent of men in their thirties and forties had university degrees. Only 5 per cent of women did. Now it’s 27 per cent for men and 30 per cent for women. The job market has been flooded with graduates, especially women graduates. What has it done for male earnings? In the past three decades the earnings of male graduates have increased not at all when adjusted for inflation. That’s right, not at all. It isn’t that the wages for particular jobs haven’t increased, it’s that male graduates are being elbowed out of the way for the good jobs, forcing them to take jobs that would have once been done by less qualified people. Richardson was surprised. She and her colleague Josh Healy had thought that low income blokes would be suffering the most. Instead “it’s the high education blokes, they no longer have a monopoly over well-paid jobs”. 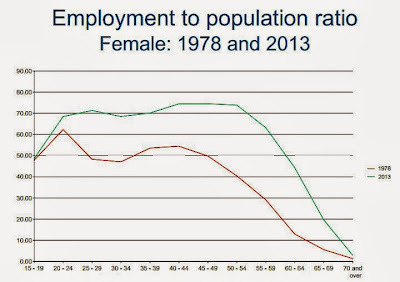 At each age group a much greater proportion of women are employed now than in 1982 - in some cases 50 per cent more. The traditional dip in employment seen in the ages when women had babies has all but vanished. 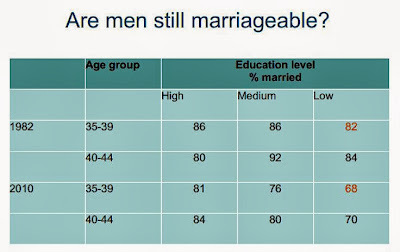 Displaying a slide that read “Are men still marriageable” Richardson asked why a rational woman would bother to marry a man who couldn’t earn an income. “You’d just have another dependent in the house” she said, to nervous laughter all around. 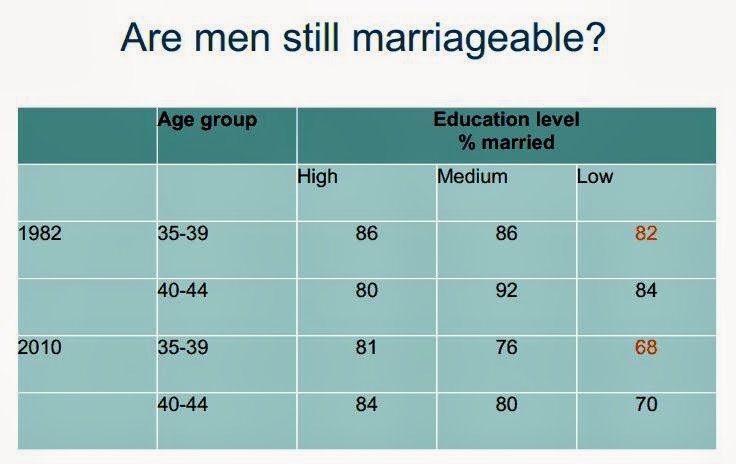 For highly educated men marriage rates are little changed, but for low-educated men the marriage and cohabitation rate has plummeted. It’s fallen from 80 per cent three decades ago to less than 70 per cent. Richardson doesn’t think this is because low income men are choosing not to marry. “They are finding it hard to attract a mate,” she says. Three decades ago there were three low-educated women for every two low-educated men. Those were very good odds. Now it’s one to one, and many of the women are looking for men with better prospects. 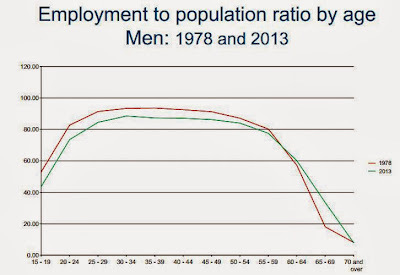 Employment-wise that change ought to be good for low educated men. They are competing with fewer women. 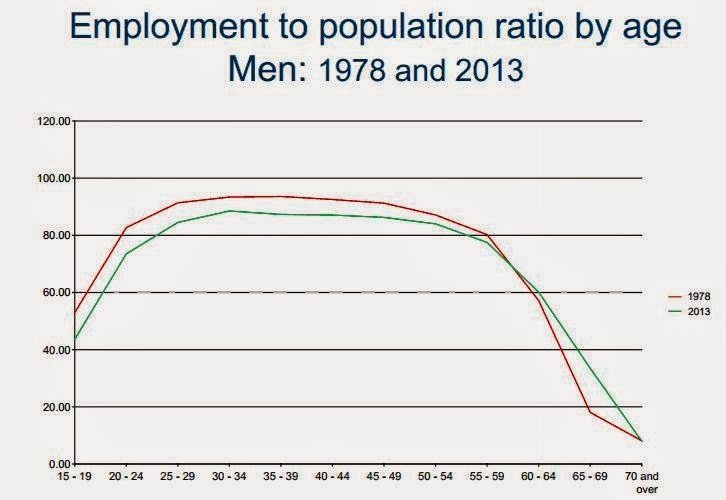 But (notwithstanding the mining boom) it’s the traditionally male industries that are shrinking. Richardson says men are accustomed “to being on top”. When they are not, they often “don’t know what to do”. Women by contrast have faced centuries of disadvantage. They are used to turmoil and they know how to take advantage of it. Abbott’s Cabinet won’t last long.